WHEN HEALTH IS A PRIORITY - These pre-portioned 3 compartment meal prep containers are best way to maintain a healthy lifestyle anywhere you go. You can divide your meals into three different sections of vegetables/lean meat, fruits and grains to have a balanced diet. Not to forget, they are microwave, dishwasher and freezer safe, so warm it or freeze it, your food will be in safe hands. MULTI PURPOSE UTILITY ITEM - Want to have a barbecue party or having a small get, together? These bento boxes will help you in many ways. You can use them as a storage container for your cut fruits and vegetables, for storing ready to eat meals such that they can be simply reheated & served, or to keep your meals refrigerated & stocked for busier days ahead. They can even help you store leftovers. 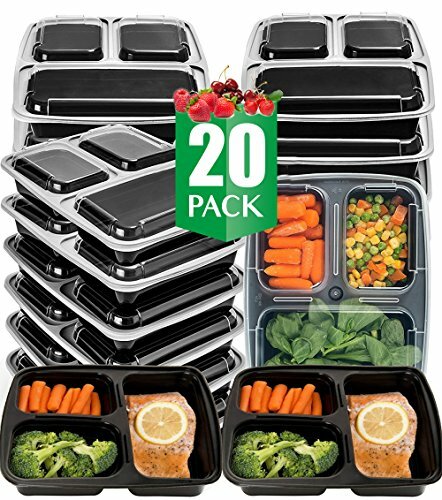 EASY, CONVENIENT AND RELIABLE - Made up of premium quality, BPA Free material, this 20 pc Bento Box Set provides quick and safe solution to keep your food handy at home or on the go. These leak resistance boxes occupy minimal storage space in your kitchen as they can be easily nested together. Moreover, transparent lids of these portion control containers help in organizing and identifying contents easily. VERSATILE, DURABLE & REUSABLE - The lunch boxes of this set are ideal as bento box for women, bento box for kids and for adults - be it boys, girls or anyone who is looking for healthier lifestyle, portion control, nutrition, diet, meal preparation, fitness or anything else. Being sufficiently strong, these do not bend, warp or break easily, are DISHWASHER-SAFE, and remain easy to reuse.